I didn’t like spinach as a child. (Who did?) Now, of course, I adore it, and every other leafy green, too: Lacinato kale, escarole, rapini, chard. I usually prepare them simply: sauteed, slicked with olive oil and garlic and spritzed with a bit of lemon. Pile them alongside any meat or on top of polenta (crowned with a fried egg! ), and you have a meal fit for a king, queen or even a 3-year-old princess. Just not my little princess, it seemed. Not that I didn’t try valiantly to get her to join the spinach-loving club. For a while, invoking the name of Mishka, a family friend, worked. Rosa adores Mishka, who in turn adores greens (and Rosa). My husband or I would say matter-of-factly, “Mishka might be coming over. You’d better eat your spinach!” It was a superficial gambit, to be sure, but that’s one of the beauties of parenting a 3-year-old. Rosa would eat her spinach to impress Mishka in case she dropped by, and I was hopeful that eventually Rosa would make a habit of eating it so that we wouldn’t have to drag poor Mishka’s name to the dinner table every night. But one day Rosa said, “I don’t want Mishka to come over anymore,” and we knew the jig was up. 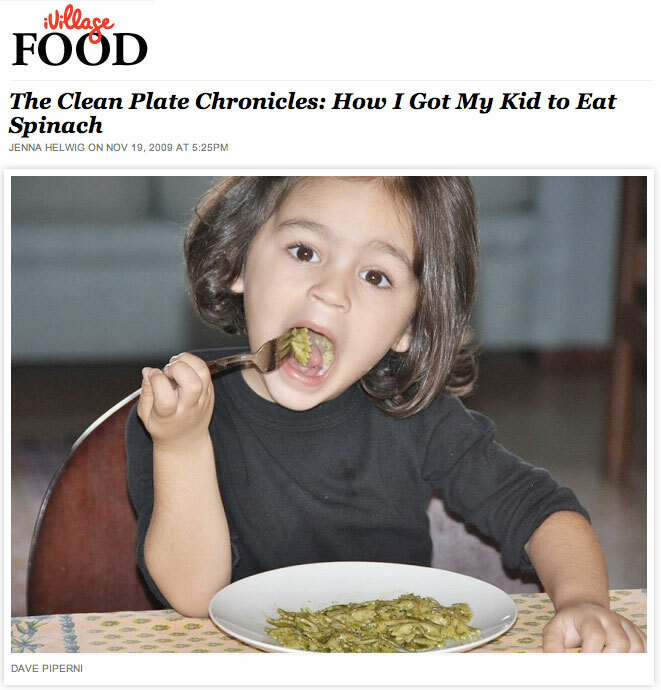 So, how did I get my kid to eat spinach? The old-fashioned way. By forcing her to sit at the table until her plate was clean, no matter how long it took. Just kidding. By serving it with pasta, of course! Rosa loves pasta, and homemade pesto is one of her favorite sauces, so I came up with another plan of attack. The next time I made pesto, I swapped out half the basil leaves with an equal amount of baby spinach, then whirled it up in a the blender with olive oil, Parmesan cheese, walnuts, salt and garlic. I mixed the pesto with some pasta, plated it, served it and held my breath. Success! But then came the big test. “Rosa,” I said. “I’m glad you like the pesto. You know, it’s made with basil and spinach.” Her mouth was so full she couldn’t respond. That was the true victory. As much as I want Rosa to eat spinach and other healthy foods, I’m not about to start adding pureed spinach to her brownies. I want her to know what she’s eating, and next time maybe she’ll think, “Ah, spinach—that was pretty good in the pesto; maybe it will also be tasty in the lasagna!” (Or however her 3-year-old mind works.) I want her to love food and look forward to sitting down to dinner, no matter what’s on the menu.